This is a list of active and extinct volcanoes in Russia. Volcanoes of the Kamchatka Peninsula of the northwestern Pacific Ocean and the Russian Far East. Volcanoes of the Kuril Islands, in the northwestern Pacific Ocean between the Kamchatka Peninsula and Japan. Aluchin 66°06′N 165°24′E﻿ / ﻿66.1°N 165.4°E﻿ / 66.1; 165.4﻿ (Aluchin) Chukchi Peninsula 1000 AD? Anyuyskiy 1054 3,458 67°10′27″N 165°50′8″E﻿ / ﻿67.17417°N 165.83556°E﻿ / 67.17417; 165.83556﻿ (Anyuy) Anyuy Mountains Pleistocene - Holocene? Annotated view includes Ushkovsky, Tolbachik, Bezymianny, Zimina, and Udina. Oblique view taken on November 16, 2013 from ISS. Atlasov Island, known in Russian as Ostrov Atlasova (Остров Атласова), or in Japanese as Araido (阿頼度島), is the northernmost island and volcano and also the highest volcano of the Kuril islands, part of the Sakhalin Oblast in Russia. The Russian name is sometimes rendered in English as Atlasova Island. Other names for the island include Uyakhuzhach, Oyakoba and Alaid, the name of the volcano on the island. The Kamchatka Peninsula is a 1,250-kilometre-long (780 mi) peninsula in the Russian Far East, with an area of about 270,000 km2. The Pacific Ocean and the Sea of Okhotsk make up the peninsula's eastern and western coastlines, respectively. Immediately offshore along the Pacific coast of the peninsula runs the 10,500-metre (34,400-ft) deep Kuril–Kamchatka Trench. Tolbachik is a volcanic complex on the Kamchatka Peninsula in the far east of Russia. It consists of two volcanoes, Plosky (flat) Tolbachik and Ostry (sharp) Tolbachik, which as the names suggest are respectively a flat-topped shield volcano and a peaked stratovolcano. As Ostry is the mountain's highest point, the entire mountain is often referred to as "Ostry Tolbachik", not to be confused with Ostry, a separate volcano to the north also on the Kamchatka Peninsula. Shiveluch is the northernmost active volcano in Kamchatka Krai, Russia. 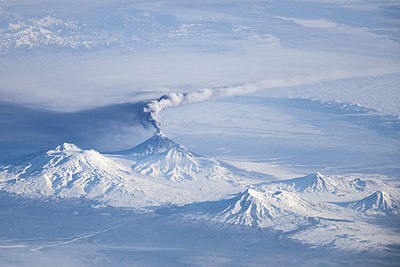 It and Karymsky are Kamchatka's largest, and most active and most continuous erupting volcanoes. Koryaksky or Koryakskaya Sopka is an active volcano on the Kamchatka Peninsula in the Russian Far East. It lies within sight of Kamchatka Krai's administrative center, Petropavlovsk-Kamchatsky. Together with neighbouring Avachinsky, it has been designated a Decade Volcano, worthy of particular study in light of its history of explosive eruptions and proximity to populated areas. Avachinsky is an active stratovolcano on the Kamchatka Peninsula in the far east of Russia. It lies within sight of the capital of Kamchatka Krai, Petropavlovsk-Kamchatsky. Together with neighboring Koryaksky volcano, it has been designated a Decade Volcano, worthy of particular study in light of its history of explosive eruptions and proximity to populated areas. Kamchatka Krai is a federal subject of Russia. It is geographically located in the Far East region of the country, and it is administratively part of the Far Eastern Federal District. Kamchatka Krai has a population of 322,079 (2010). Mutnovsky is a complex volcano located in the southern part of Kamchatka Peninsula, Russia. It is one of the most active volcanoes of southern Kamchatka; the latest eruption was recorded in 2000. At the foot of the Mutnovsky lies a geyser field, popularly known as the Lesser Valley of Geysers. Opala is a stratovolcano located in the southern part of Kamchatka Peninsula, Russia. Vilyuchik, also known as Vilyuchinsky is a stratovolcano in the southern part of Kamchatka Peninsula, Russia. It is located about 30 kilometres (19 mi) SSW of the closed city of Vilyuchinsk. Zhupanovsky is a volcanic massif located in the southeastern part of Kamchatka Peninsula, Russia. It consists of four overlapping stratovolcanoes. After 54 years of inactivity, the volcano began erupting on October 23, 2013 and again in 2014, continuing nonstop into 2016. Gamchen is a complex volcano located in the southeastern part of Kamchatka Peninsula, Russia. It is composed of four stratovolcanoes. Ichinsky is a large stratovolcano located in the central part of Kamchatka Peninsula, Russia. At 3,607 metres (11,834 ft), it is the highest peak of the Sredinny Range, the central range of the peninsula. Ichinsky is also among the largest volcanoes in Kamchatka, with a volume of about 450 cubic kilometres (110 cu mi). Zimina volcano or Zimin is a stratovolcano located in the central part of Kamchatka Peninsula, Russia. It comprises two peaks: Ovalnaya Zimina and Ostraya Zimina. Udina is a volcanic massif located in the central part of Kamchatka Peninsula, Russia. It comprises two conical stratovolcanoes: Bolshaya Udina and Malaya Udina. Penzhina Bay is a long and narrow bay off the northwestern coast of Kamchatka, Russia. The volcanoes of Kamchatka are a large group of volcanoes situated on the Kamchatka Peninsula, in eastern Russia. The Kamchatka River and the surrounding central side valley are flanked by large volcanic belts containing around 160 volcanoes, 29 of them still active. The peninsula has a high density of volcanoes and associated volcanic phenomena, with 29 active volcanoes being included in the six UNESCO World Heritage List sites in the Volcanoes of Kamchatka group, most of them on the Kamchatka Peninsula.